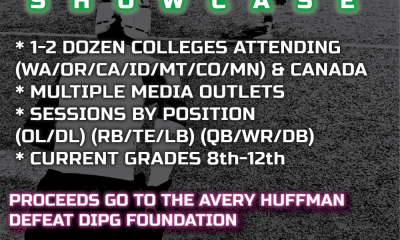 In this day and age of the Internet, HUDL, Scout, and Twitter it seems impossible that a future D1 caliber talent could be missed. But what if coaches and analysts have become so reliant on technology that only those with film get looks and media love? What if a kid has almost zero social media or recruiting footprint and does not self-promote? What if he does not have a big network of people behind him? And what if he was 6’5″-240 lbs and could run with almost no body fat? It happens- these rare cases- and only the sharpest of recruiting eyes would find a kid like that. There are a number of reasons this happens and I want to illustrate how this happens partly – and it is never the kids fault! Check this out- and tell me if you agree. 1: I reviewed this twitter feed after seeing the picture of this BEAST in the twitter feed. 2) As an analyst out of Portland (OR) who covers and knows the NW better than most anyone I did not know who this was. Look at the Red arrows here. A) He has almost no Twitter followers. B) He does not Tweet much – too busy with football and school. C) His name is not on his profile. D) He has stated he is a D1 Talent – We love that- but all players post that. It’s usually not true. 3) So – like any coach will do – I click the HUDL link- that he NAILED – the link is mandatory here boys! 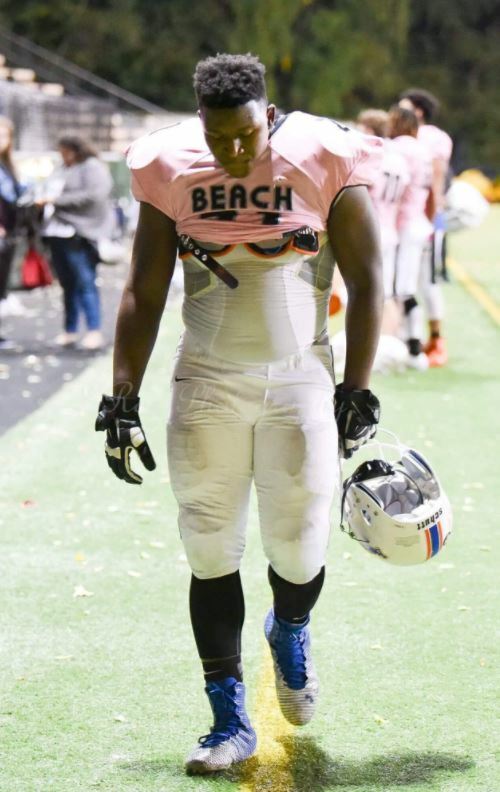 4) His HUDL link shows me: A) His name is Kendall Williams Jr. B) He is a 2018 Athlete at Ranier Beach in Seattle. C) It shows us he is a T, TE. D) His profile tells us he is 6’4″- 230 lbs. E) There are several pieces of film linked to his profile. All of this is fine. I am really excited about this – the fact it is outdated and wrong because this kid is SO MUCH BETTER than this. HUDL is only going to tell the story it has to tell. A) His name is Correct. 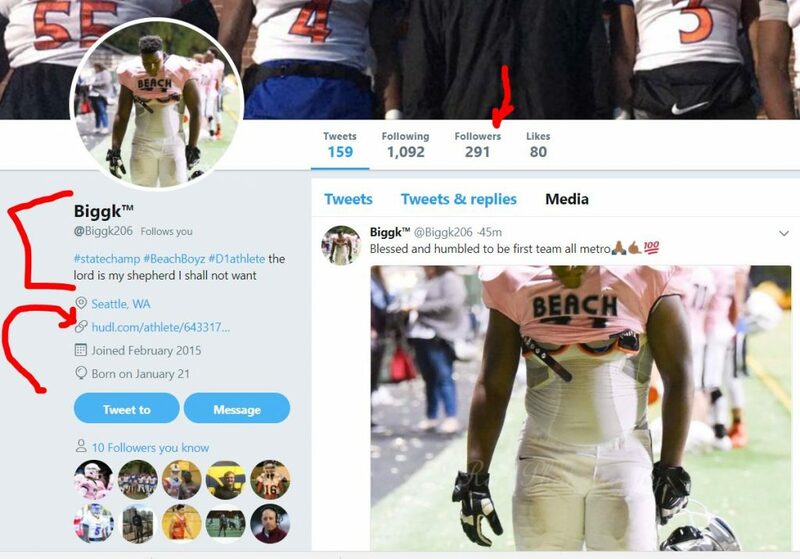 B) He is a 2018 Athlete and Ranier Beach. C) He is a DE/DT- not a T/TE. D) HE IS 6’4.5″ and 275 lbs. and quick! E) All of that film is at least a year old and not relevant to who he is Right now! Coaches you guys know me. You Big Sky, Mountain West, Pac 12, and JUCO guys that call me and encourage me each year – you all know my history and background and my record of finding the gems- the guys who have the physical and mental capacities to go all the way. I turn over rocks, pebbles, and sometimes boulders. This guy has lifted the boulder himself and is coming out for round 3 of the playoffs with his Beach Boyz! 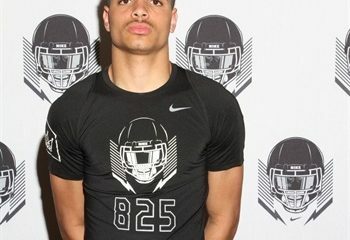 Kendall Williams Jr. may be this same caliber of a player. Here is the film he updated the day after this story originally posted- it’s very good stuff! We have been talking, he and I, and while I can not go into the backstory I will say that Kendall is a great kid. This is a kid that has a need at his core to succeed. He has a family situation that has at times held him back but at the same time, it is his reason to push ahead and play with an edge. He has a purpose and drive and knows what he wants and to date has had nobody outside the team look at him. I propose we change that and give him a hand up! 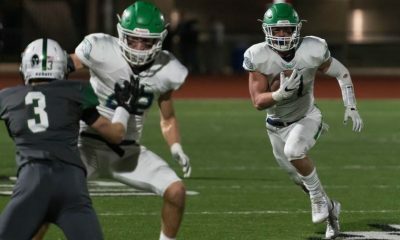 He was just named 1st Team All Metro on Defense– this only backs up my supposition that he is a D1 caliber athlete. This week and every week until the Ranier Beach Football Team loses is all about the playoffs and so I am not doing an in-depth with him. 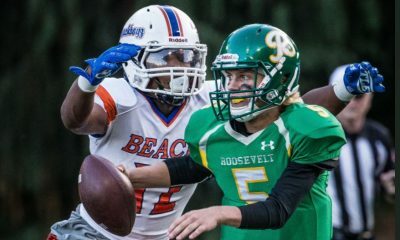 But I want you College Coaches and recruiters who will be watching Ranier Beach, a team loaded with College talent, to give him a look and know the answer to why he has no offers and not much-recruiting love. We love these stories and this kid is a winner. One way or another he needs to get a shot and we aim to help him! Because world this is Kendall Williams Jr.